Stunning gloss black plate glass panel set with a striking bevelled edge. In the centre is a contemporary print, that is actually raised away from the glass panel giving great depth to the artwork and a 3 dimensional feel to it. The print here is New Shoes by Meijering. These really are fabulous pieces of artwork which have a great contemporary look. Perfect for any living or working space. They look great in pairs too. A great gift idea too! 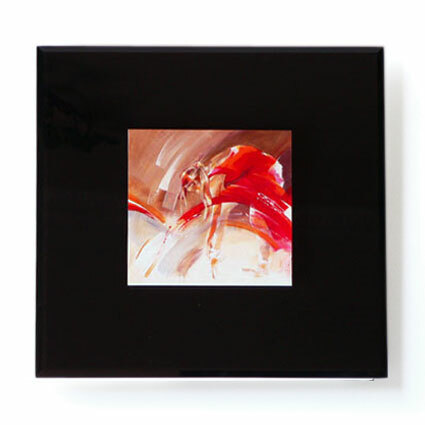 The glass plate here is 30x30cm (12x12") and the centre print is 14x14cm (5.5x5.5").